Peg is an avid collector of vintage treasures. 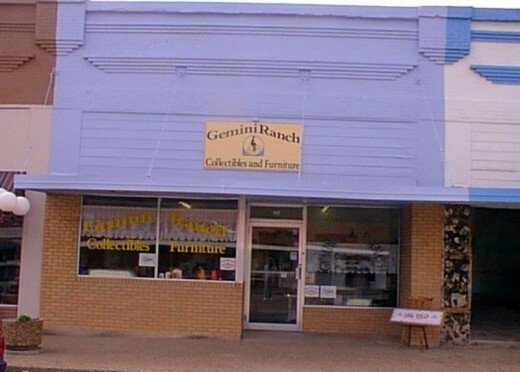 Her passion for retro goods led her to open a retail Furniture and Collectibles Store. 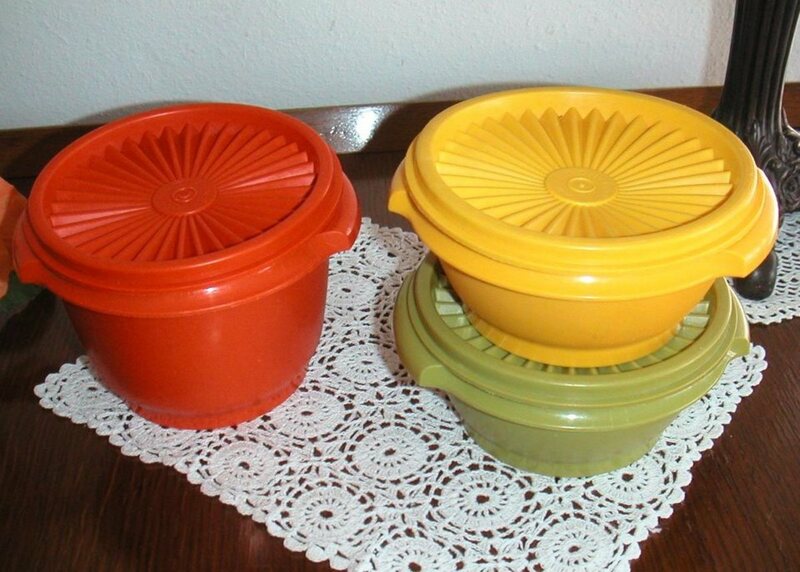 Containers came in vibrant colors in the seventies. These Tupperware containers are hard to find. Spending wisely was an important part of my childhood and later setting up a household on a budget. Our family often shopped at thrift stores, resale shops and yard sales for things we needed. Our reward was tools, toys, furniture and more for a fraction of their retail price. After a good scrubbing with a little soap and water, we put them to good use. Hull Tangerine mug in mirror foam finish with matching unmarked caraffe. 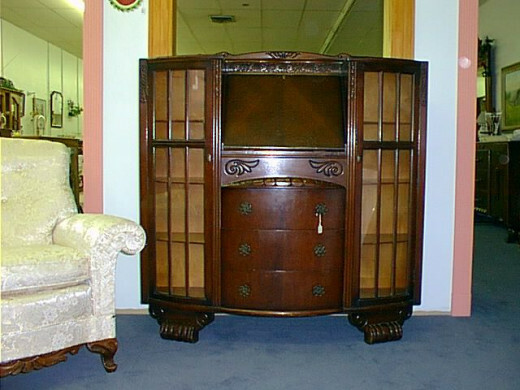 The best advice when shopping at an antique store, flea market or resale shop is, "The time to buy an antique is now." Never expect to find your beloved item if you go back to purchase it later. They're not making any new antiques and many are one of a kind. 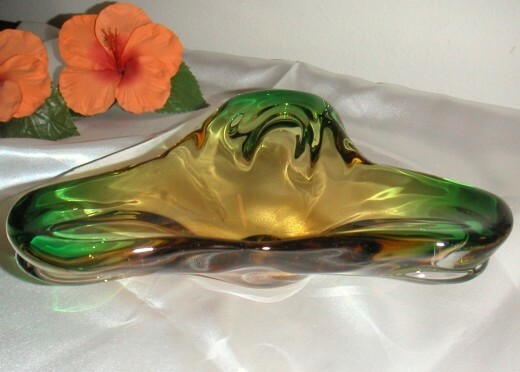 Murano glass was popular in the fifties and sixties used for decoration and as ashtrays. Many weekends were spent at flea markets, garage sales and auctions. Once I attended my first auction, I was hooked. 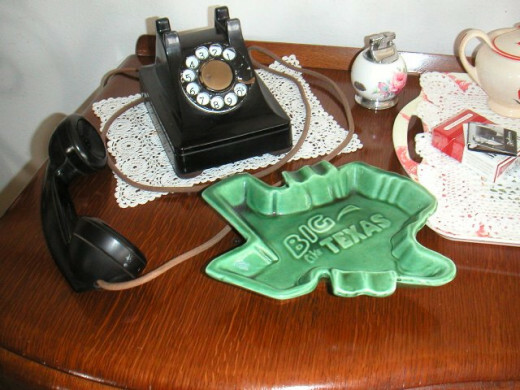 The excitement of finding and bidding on a treasured item would inspire me to later open my own collectibles store in Texas. This dinnerware from the fifties, known as Hull House 'n Garden Ware, came in a variety of colors like turquoise, green, orange and mirror brown with ivory foam trim. The sets were sturdy enough for use in the oven. 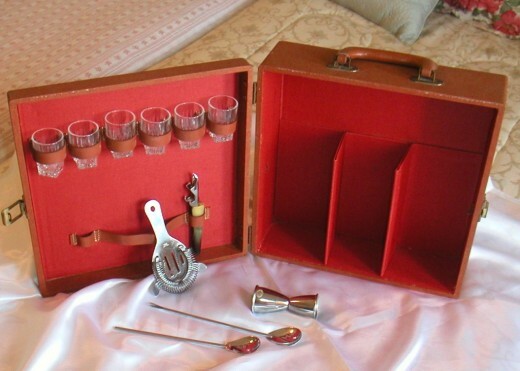 Sets included cookie jars, serving platters, mixing bowls, bean pots, mugs, teapots, pitchers, plates and saucers. This collection was purchased one item at a time over a period of years. It's getting harder to find Hull pieces now as it's no longer being manufactured. 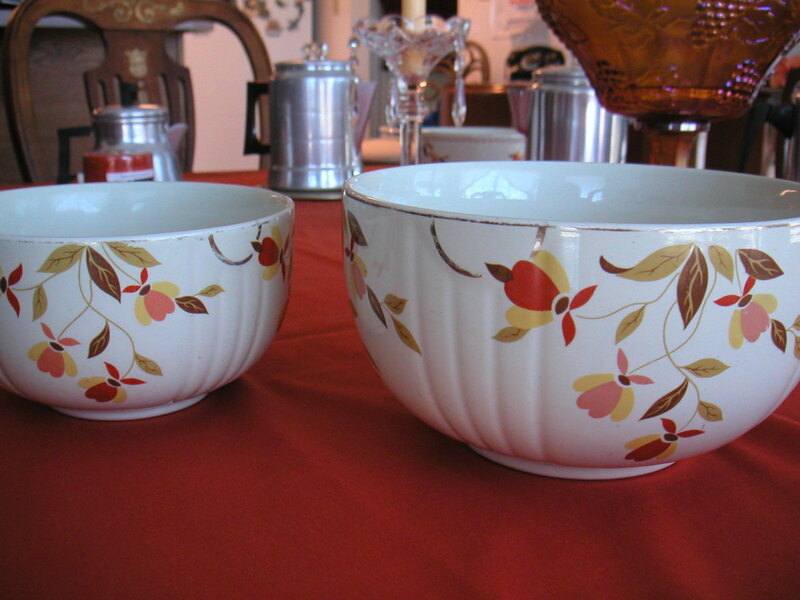 This Flare Ware pattern is from the sixties, made by Hall China, one of the oldest manufacturers of dinnerware in the United States. 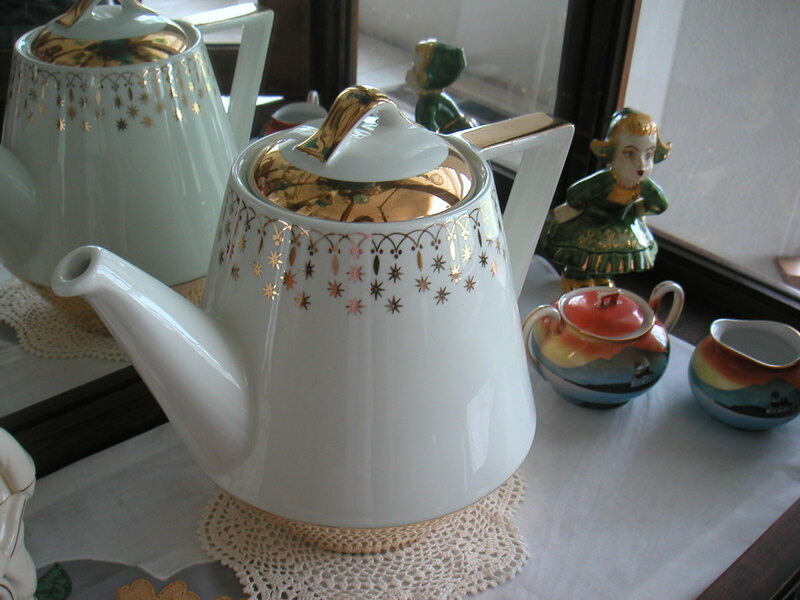 The electric warmer still works and the pattern nicely matches my modern holiday gold-trimmed dishes. Finding bargains can be a lot of fun. On one television show, they feature American Pickers who drive across the country seeking "rusty gold and barn fresh treasures." This pastime can become addictive. 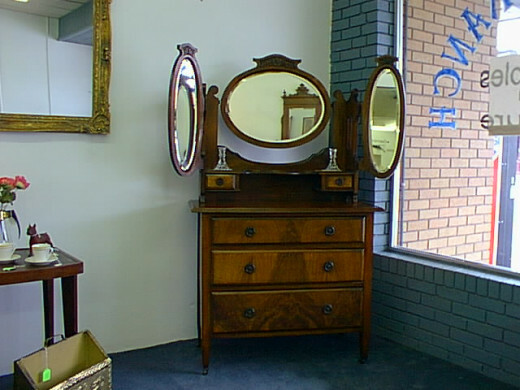 This solid oak Bonnet dresser is from the 1860s. Imagine crossing the prairie with this piece in your covered wagon. 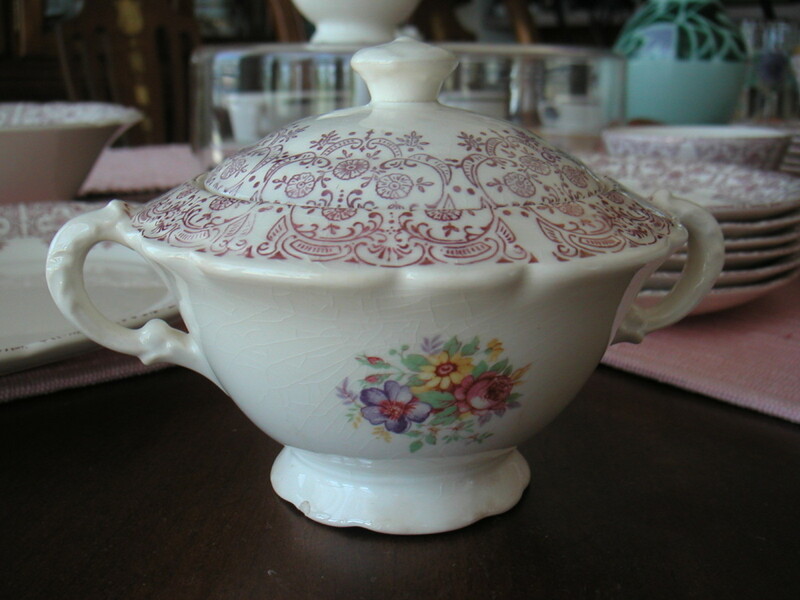 Vintage American made dinnerware is a favorite of my collections. Often discovered one piece at a time, it's a joy to discover another item and bring it home. Soaking them in a warm, sudsy bath makes me feel like I'm rescuing a piece of history. Auctions are a good place to learn a little about the history of each item. A good auctioneer will tell a story about items trying to entertain the audience and build interest. 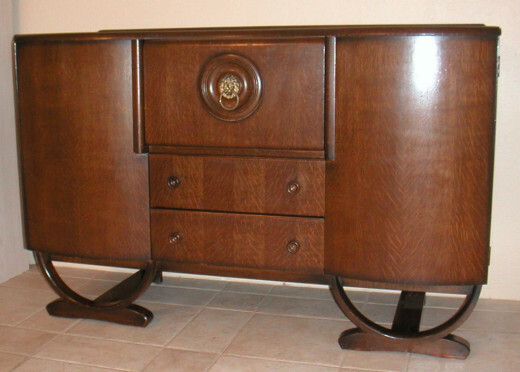 One of my favorite auctions is in Fort Worth, Texas featuring container lots of French and English furniture. Tuesday nights at an auction in Garland, Texas, the auctioneer had a great sense of humor. When the bidding got intense over a particular item he would say, "The buzzards are circling." Most auction houses allow a buyer to register before purchasing items, with or without a tax exemption number. They give bidders a paper placard with an assigned number used to record the items they bid on. Don't worry if you scratch your nose. That usually won't be mistaken for a bid. For rookie buyers, the auctioneer often asks, "Are you waving at someone or bidding?" before they scream, "SOLD!". St. Petersburg and Clearwater, Florida are great places to find vintage items. Retirees who make the move to a warmer climate often donate their excess household items when downsizing. Goodwill, Salvation Army, Donation Station, Friends of Strays, and Junior League stores yield treasures fresh from dusty attics, barns and storage units. 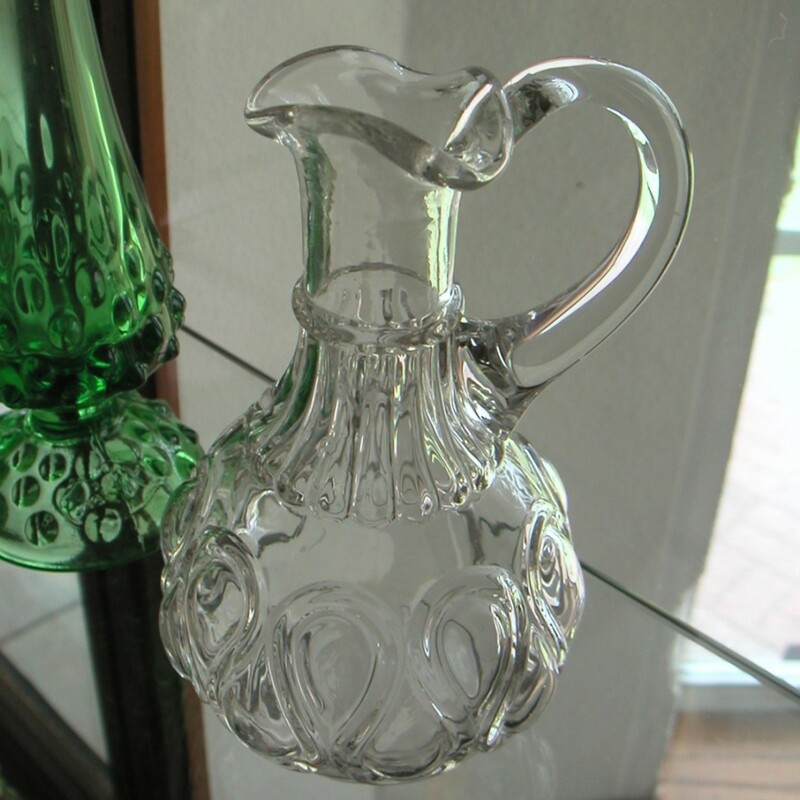 This patterned glass vase is from the late eighteen hundreds in a pattern called Ribbon Candy. It came from an estate sale where the seller's sage words of advice sent me into a land of discovery about items and their history. Collector Series books were the source of values before the internet. They listed approximate market values and the history of the pattern. Items can be easily researched on line now. It's easy to find approximate values for items via the latest sales on eBay auctions. Be sure to check the sold prices rather than checking the list or asking price. An item is only worth what the market will bear. 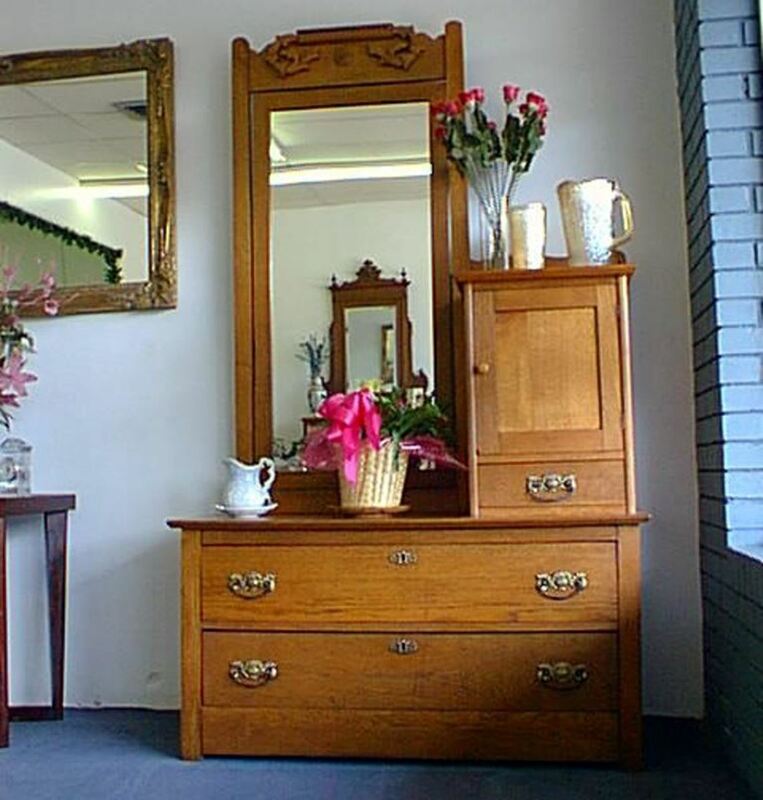 Do you enjoy shopping at collectible, antique or thrift stores? Yes, I've done this for years. Yes, I'd like to own a store. I've found a lot of bargains at these type of stores. No, I've never been in an antique store. 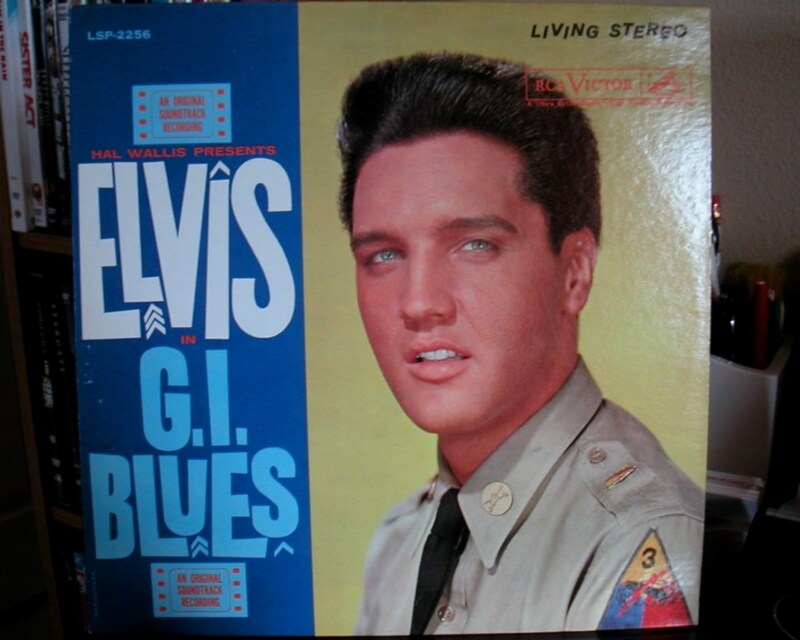 Long playing vinyl records are making a comeback with vintage items like this Elvis recording bringing high prices. "You'd better get down here," she said. "Downtown is on fire." The call came late one night from one of the downtown merchants. It was past midnight when we sat together on the sidewalk and watched several stores burn, not allowed inside while firefighters from three local stations battled the blaze. Hampton cleaners next to my store suffered extensive smoke damage. The shop next to them, an uninsured candle shop, burned completely to the ground. The next day there was a second fire across the street affecting several more stores causing extensive smoke and water damage. Reconstruction seemed to take forever. 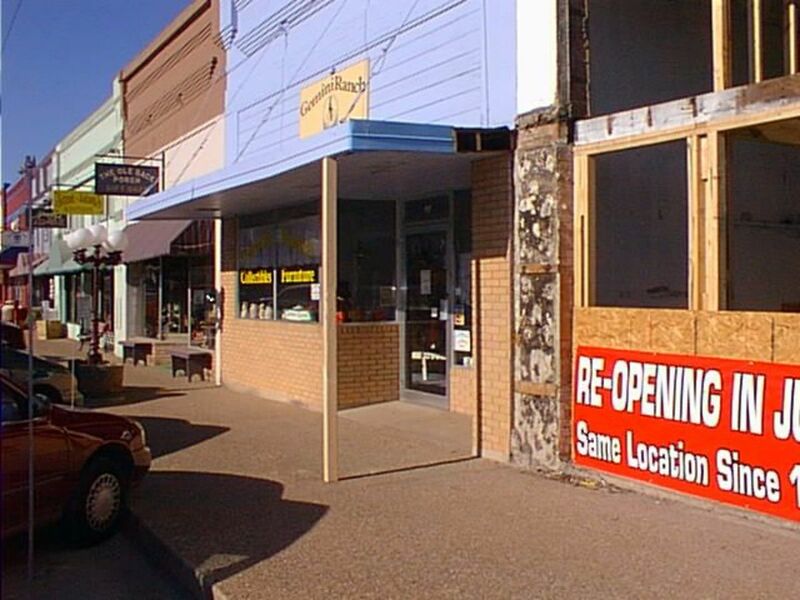 With nearly half of the stores on the street closed for repair, business suffered. The fire was determined to be caused by faulty electrical wiring. I pictured the frayed web of wiring in my attic and cringed. One year later, I closed my business for good and continued working my day job. I still miss the smell and feel of walking into the store, looking over all the vintage merchandise and spending the day with those mementos from the past. Hampton Cleaners next door had major smoke damage. Hi Larry, I still enjoy visiting the antique stores and finding buried treasures. Thanks for coming by and for your kind remarks. A fascinating article, Peg. As the photos in your story shows many an unusual item can be found at those type of stores. My wife and I love going through and looking and looking. Sorry about your store having to close, that is sad. Hello Vespawoolf, Thanks for the kind words. I often think of the store and the fun I had setting up displays, going to auctions and meeting new customers. I was working a full time job at the time and it became too much to work seven days a week when I started traveling on business about 70 percent of the time. You and I could have some fun sleuthing for treasures, I'm sure. I'm sorry your store had to close. That type of business was right down your alley! You have found some gorgeous items through the years. I also enjoy thrift store treasure hunting and do it whenever I have a chance. Thank you for sharing. Hi Merrci, thank you for the visit and comment on this thrift store hub. I'm also trying to resist, but I went to a store last week (bad idea) and found some melamine plates, a teapot, two Corelle platters, a lavender glass pie dish and other things that hopped into my basket. Oh, my. Very fun article to peruse too! Every time I go into a thrift store or stop by a garage sale I wish I had more knowledge of what has value and what doesn't. I'm in the simplifying stage now, so I try to resist these days. It is very interesting to see your finds! Hello Kaili Bisson, Thanks so much for checking out these treasures. I wish you all the best in your sleuthing efforts. Good hunting. My goodness, you have been lucky! What a great hub. I love Rookwood, so now I will have to start keeping an eye out at the local Value Village. Hi Suzzycue, Thanks for stopping by. I love these old things but I'm on the downsizing mode at this point. There's a lady coming to the house tomorrow to pick up a few furniture items I no longer want. She has a booth at one of the stores in Farmersville. I guess that will give me room for a few more old things. Wow! It looks like you have a real knack for finding things in thrift stores. I haven't been in a while. This makes me want to go! I am so glad to meet you too, Peg. All of the short lived shop project experience taught me much about running a retail shop alone. Mostly, I so admired my neighbors next door who gathered used furniture and were partners in business. They could count on each other for ideas and help. Starstream, I would love to have visited your shop in OR. Whenever I travel, I try to find at least one collectibles shop to browse. Thanks so much for the generous comments! It's nice to meet you. P.S. Beautiful digs you've got there and yes, I enjoyed this hub. I love thrift store finds and your finds are real treasures. I also have done this for years but my house is full to the brim. I found a handmade box this weekend thrown to the curb. It was beatifully made with a lid with chain. So it has become part of my collection. I often wonder how people can throw away hand made treasures of this kind of quality. Awesome finds! In fact they found you. Collecting these pieces adds to our understanding of history too. I enjoyed reading your article which is interesting and informative. Your little shop reminded me of the Angel shop I opened many years ago in Rogue River, OR. It only lasted less than a year because of the old building electric requirements and lack of foot traffic. I love collectibles and wrote a few articles about that at the hub. Hello Shyron, My Aunt Jessie had a Singer pedal sewing machine, too. She would let me work the pedal while she sewed. I have such great memories of her. Thanks so much for reading, voting and sharing. I love collectors, they/you have such passion for the beauty you can find in great workmanship, and the pride in finding American made goods. I love your pictures also. My grandmother had one of those Singer sewing machines. Thumbs up across the board and shared. Prairieprincess, what a charming comment you've left for me to find! Thank you. These old things call out to me, and as hard as I try to walk past them, I just can't. It is as if I'm rescuing them from oblivion and restoring them to a place of dignity. I'm so delighted these things reminded you of wonderful memories of your Mom. Bless your heart, dear one. Oh Peg, your hub touched my heart, and was an absolute pleasure to soak in. I loved how you shared your adventures and experiences with these old objects. You obviously have a great passion for beautiful, old things, and I was definitely not offended at having to look at them. I loved it! Some of the items you have remind me a lot of my Mom's stuff: the black t-cup and the bluebird dish. She also loved picking up these old treasures and once worked at an antique shop. Thank you for an enjoyable read, and wonderful memories of my Mom. Take care! You're right about the best time for garage sales, Au fait. During spring cleaning, people are clearing away stuff they've stashed away during the cold days of winter. With the kids out of school in June, it's a good time to hold yard sales to clear space for the upcoming school year. And the holiday season seems ripe for gleaning treasures both new and old. This is the time of year for yard sales, although here in Texas we have them year around. I really like yard sales and thrift stores. They're always full of surprises and often some real bargains. Right after Christmas is a good time to go too, when some people have those gifts they received that they don't want in their sales, and so things are often new. Yard sales and thrift stores are great ways to find some real treasures at bargain prices, plus they're entertaining too. Hi there Eileen. I used one of these old sewing machines as a kid also. No electricity needed! Thanks for coming in to take a look at these collectible items and I'm so glad you enjoyed the pictures. What a wonderful collection you have there Peg. I love the old sewing machine I remember using one of them as a kid. 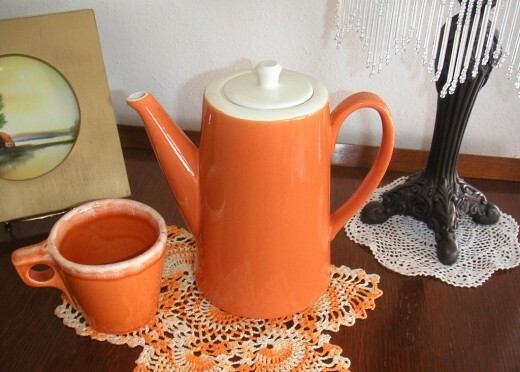 I love browsing garage sales for bargains but have never picked up anything as lovely as some things in the photos. Great collection of photos too. Hi Peggy. Yes. I'm still addicted to the thrift store allure. In fact, just last weekend when my sister was in town, I bought an oak table from the 1880s just to preserve it's beauty. I'll enjoy displaying some more items on it that I found while browsing with them. Hopefully, it will move into my study and become my work desk. Thanks for your insightful comments and for the visit. Hello Au fait. Me too. Now I have too much stuff and I'm on the selling end. Of course, once I reduce the volume of dust catchers that I am prone to buy, then I'm tempted to go out and use the revenue to buy "new" old stuff to replace what I've sold. I always find something I love when I'm out 'saling' in the thrift stores and yard sales so I have to control my impulse to stop when I see that magnet of a sign advertising a garage sale. Thanks for sharing your love of this hobby with me and for stopping in to view these finds. I used to enjoy going 'saling' (yard sales) every weekend and I made regular treks through the local thrift stores every few weeks too. I would still go, but I should probably have a couple 'yard sales' myself! I wasn't searching for antiques like you, but just the same, you never know what you'll find. I did sell a few of my finds on eBay and did pretty well. Great photos of your treasures! So nice that you are sharing your experience in this area with everyone. how can i find out how much the amber iridescent dish is worth??? Hello MarloByDesign. Thanks for the visit and the great comment and votes. Great finds!!! Thanks for sharing your pictures. Great Hub. Voted UP! Trish. I'll be zooming over to check out your yard sale hub. As you know, it is one of my favorite topics as well. Smiles. 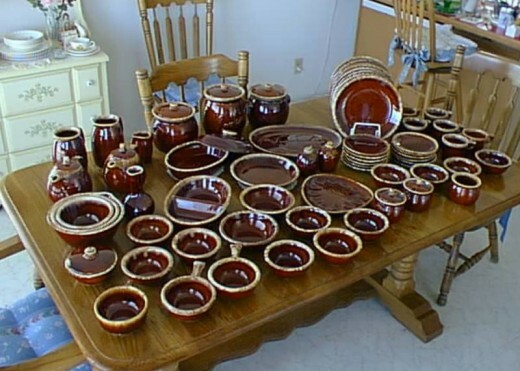 I was mostly selling on eBay, getting rid of the leftover dinnerware and beautiful glass ware from the store. It's tempting even now to stockpile these beautiful things, but I'm trying to quit! See you soon I hope. Oh, I didn't sell on Ebay, all I did was buy, that's why I said if I didn't stop when I did I'd be turned in as a hoarder. I have made an occasional visit to Ebay in the years since, and found myself totally disappointed in their changes. What was once familiar, was no longer. Trish, thanks for your visit and for sharing that great story about your friend with an antique store. I used to love it when customers would stop in and spend a few moments having coffee or just visiting. One lady used to bring me tomatoes out of her garden. I looked forward to her visit whether she bought anything or not. You were fortunate to sell on eBay when you did. Those years selling on line was very good for me after the store closed. Prices have dropped considerably at the moment, but you know what they say, buy low! Again, I'm so glad you stopped in today. A hub so dear to my heart! I have always loved old things, and became a very avid collector over the years. I finally found myself in a situation where I had to put the brakes on, and it's now been a good 5 years or so that I've purchased any treasures. I thought, what a charming woman! Over the years, I purchased many things from her shop, and several times, as I browsed through her shop, she'd offer up an item as a gift. Her reason, she explained, was that she had no room for it any longer. I can't begin to tell you what amazing things she gifted me. I eagerly accepted them and brought them home to grace my home. I decided one year to investigate Ebay. What a blessing/mistake. Yes, both. I was so addicted that I was on a first name basis with the UPS guy. I had things coming to my home I'd say 4 out of 7 days every week. So, when my bottom fell out, as I look back, it was a blessing in disguise. I am convinced, had I continued, that I'd be featured on the show Hoarders lol. Epi, you darling man, please give my kindest regards to Tiffy and Gabriel. Oh my, Winter. Old man Winter. Makes me want to sing. I'm hoping you had a nice gathering with folks that you love when you celebrated, Epi, of whomever, if fur-based type, my personal favorite type of guests. lol. We had a wonderful time with me spending most of the day in my kitchen where I play the radio and dance around baking. It is like a dream. Sometime if you have time please check out my blog. I do test recipes! Thankfully I have a ready test group who like to eat it, Mom and Louise who turned 92 this year. We are grateful for them being nearby; it is such a joy to have them in our lives. Thank you Colin, for being in my life as well and although I don't visit often, when I do, it always amazes me at the range of talent you have. Please don't be a stranger. ...your fascinating hub presentation (loaded with interesting photographs) is a treasure hunt in itself and it reminds me of the Salvation Army thrift store that I have here where I live in the neighboring town of Dunville - it's just amazing what one can find for such great low prices. And you never know what you will find - there is something for everyone and everyone has a different ideal of what that holy grail is. I could feel this hub assignment was a true labor of love for you and I got caught up in all of the excitement of the 'big hunt' and its rewards. Hello Carol. Thanks for zipping in on your way to book reviews. The finds are getting harder to locate and lots of the new things like from the 80s and 90s are showing up. Vintage stuff is getting rare. I'm glad you found your way here to take a look and thanks for the great comment. I was about to check out some book reviews and couldn't pass this hub up. Wow you certainly have gotten some great things at thrift stores. We have a bunch here in Prescott, Arizona...but never saw these lovelies. Great hub and photos. Me too. The dusty boxes that have to be dragged out from under stuff is where the treasure is found! Thanks for the visit. Nice to meet you. Thanks for finding me Carter06. 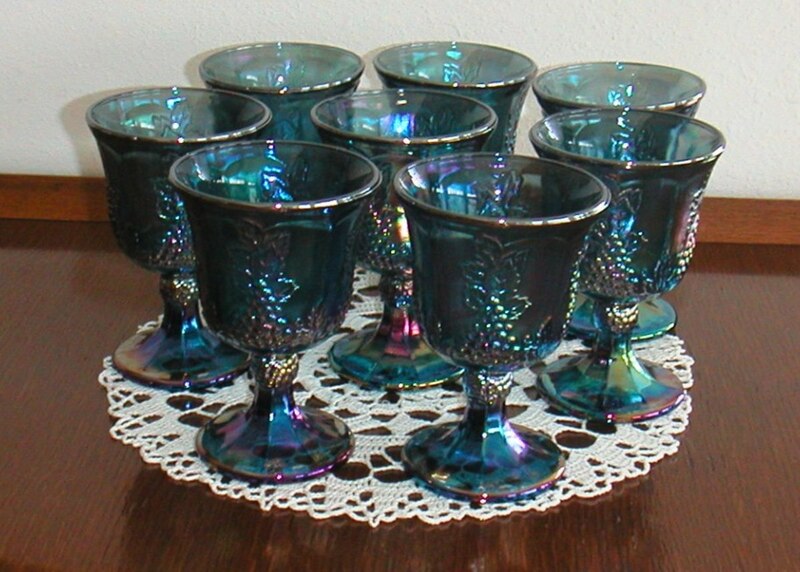 I loved those green glass goblets too. They are delicate and wonderful examples of a different past when we used nice things to drink from rather than plastic or paper cups. Thanks so much for reading and taking time to comment. I enjoyed meeting you at the Cafe recently. I have a few pieces of the hull dinnerware left. Great hub about some marvelous finds. We still have some old books too. This stuff just never goes out of style, awesome! Thank you Whalefeather2! Saturday is a fine day for finds! Thank you Monica. We'll use them for a toast to our next find. Cheers to us! I love yard sales, thrift stores, flea markets, antique stores, and old stuff! When I got my first house, I was just in my late 20's when someone told me my house was like a grandma house. I took it as a compliment, too! If it's modern, I don't want it. And new isn't anything special in my book. Loved this hub and the photos. Great finds! Thanks Rebecca! All the best to you in your search for treasure. Good for you! I love thrift stores and yard sales. You are the Queen! Hello there skye2day! So nice to see you again today, sweet. Yes, it is true that God sends us things to find. Seeking is the fun part! I understand about selling the good stuff when the time comes too. Have done that a few times myself. Hi Angela, Wow. You live in an area rich with old time treasures. Once I was in Omaha for a short stay and spent most of my time in the tiny downtown with its historic shops. I found a beautiful 40s tailored suit with horsehair shoulder pads, an evening jacket and a cosmetic cigarette case with rhinestones on the top. How I longed to go back for more! Let's go. You can show me around your area! peg I love your hub sister. Thank you for a great read. I love the dishes. What a find. I so love salvation army, goodwill, savers, so on. I have scored several treasures. Many have sold when hard times hit, many stay with me. I always consider the treasures I find a God deal. He just loves to send winks to His kids. Love ya peg you are precious indeed. Really amazing finds. I would love to go shopping with you! Lovely hub Peg. I had a store too, imagine that. Mine was 1700 sq. feet in the old town section of a little town in OH. 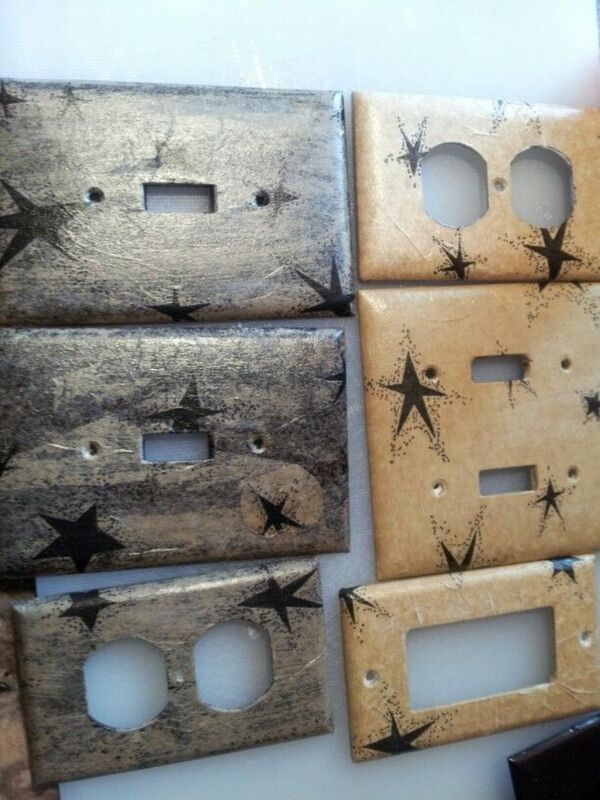 We had the tin ceiling tiles also. I miss it so much. I loved it. The searching is such fun too. I have a Depression Glass Thumbprint pattern punch bowl set. Glass ladle, 12 cups that sit on the platter under the bowl. I found it for $7 at a yard sale. 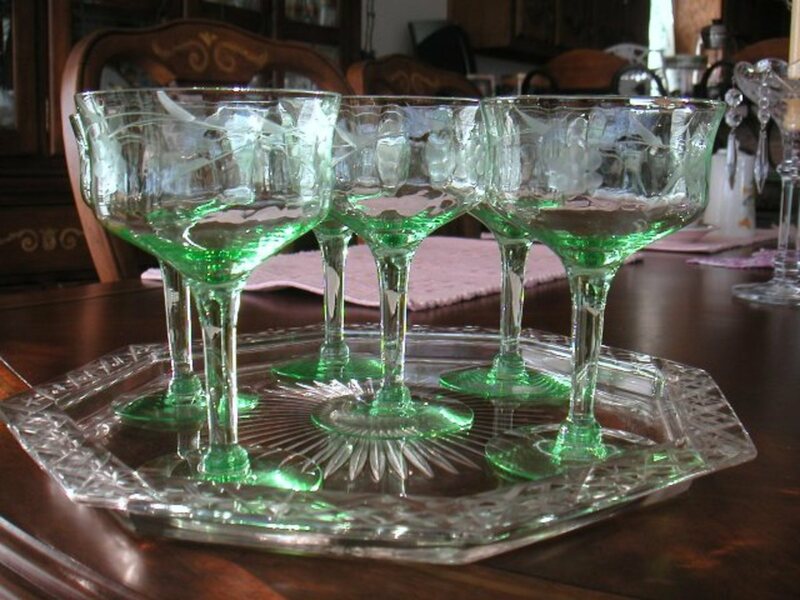 I also have an entire set of dishes with matching crystal that was my grandmother's. I have a couple of old trunks with my great-grandmother's crazy quilt and the year 1905 embroidered in the bottom corner. Also her old Bible from 1895. I treasure these the most but also have a Hall Chrysanthemum vase and several Hull vases and planters. I guess I am going to have to write a hub about my treasures as soon as I can borrow a camera long enough to take some pictures. Hello Kartika. I can relate to the simplicity mode and in fact have been reducing my collection quite a bit over the past few years, selling it on eBay to weed out some of the clutter. But you know it's hard to let go of these pretty things once they have become familiar items. 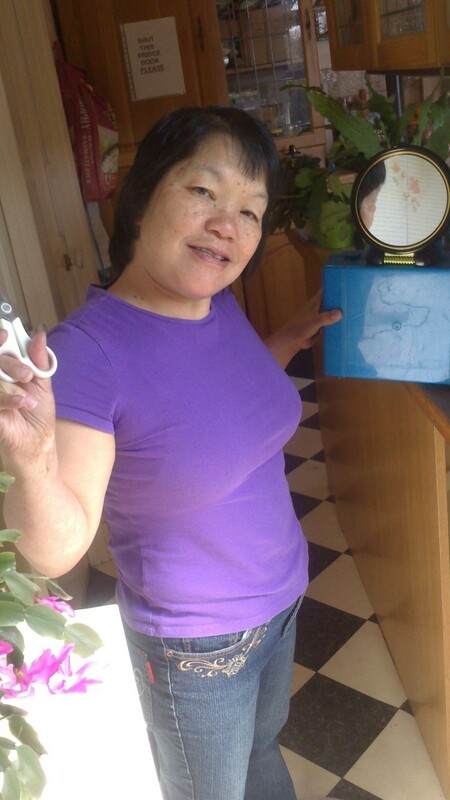 I'm trying hard to get rid of extra stuff and I'm definitely with you on reducing housework! OOOoooooommm. Peg, Ah yes! I used to be a collector and also a seller of collectables and antiques so I recognize your collections. There is always something exciting about finding those special things at special prices - I remember it well. Now, I've gone a bit Zen and that has its upside - a lot less dusting. Yes, we have a blast. Tuesday is my flea market day and today I found a beautiful, delicate china plate. It's rectangular and white with handpainted red fruits and leaves. It looks European, but there aren't any identifying marks on it. I only paid $1 and I love it! I really enjoyed reading about your beautiful finds. I have recently also begun to "treasure hunt". Would you believe, here in Peru, we have a flea market with used objects brought over from the US and Europe? We find all kinds of amazing things and, as you said, it's the sleuthing that's fun. Voted up and awesome! Hello Thelyricwriter! Thanks for the visit to my collection of dusty treasures. You know that research is essential to picking the good stuff out of the rest of the sparkly things. I'm not sure I know the term "cherry pick" other than as a good collection of undiscovered gems. I collect for fun rather than resale these days and for the joy of rescuing an otherwise lost and discarded item. The store's been gone for a dozen years and now houses a pediatric clinic. Time moves on. Thanks for the nice comments and the visit. Voted up, useful, awesome, and interesting. Awesome finds Peg! I love getting great deals on collector items. I love history and all artifacts. Many people would be surprised at the items people sale that are highly valuable. Very important to research your items so you are able to take advantage of such situations. I know people frown on the "cherry pick", but you are entitled to make a living. Great article Peg. Best wishes and look with your shop. Hello B.Malin, You are definitely in the right zone when it comes to treasure hunting. There are some terrific stores in your area where amazing items can be found. I lived in Miami for years and went to HS there. You're are a bit north of where we were in a really beautiful part of the country. Thanks for the nice words about my old store. I do miss it sometimes. Hi PegCole, I Loved this Hub of yours on Collecting. I love going to Antique Stores, which we have so many of here in N. Palm Beach. What Treasures can be Found! I also enjoyed reading about your business. Bargains are out there...seek and you shall find! Thanks for sharing your Wonderful Pieces. I don't think anyone should be offended by your photo display of treasures. I like things from Grandmas table and beyond. Very nice selection of goods. Well cared for and worth the cost. : ) Enjoyed your treasures. Thanks for sharing it with us!! Thanks for reading this one Alastar. No money trees in my neighborhood. I do enjoy patronizing the Mom and Pop shops. It is great to see the small businesses thrive. The vase was a special rare find. Come back by anytime! Ah, you learned early that money doesn't grow on trees. That unfortunate fact comes a little later in life for some of us though lol. Goodwill and Salvation Army are great places to thrift shop of course but often its the Mom and Pop's that really hold the unusual and exciting items. Enjoyed your story of ownership, descriptions and thrift pieces Peg, awesome find with the vase! Here are your Nancy Drew books! I saw even more of them last weekend but didn't pick them up. They had The Hardy Boys too. Dad had a huge collection from the 30s that he had given us kids. Of course, they went astray in my many relocations. So I have to buy them back now. Thank you for looking at my doilies and old dusty treasures. I can't seem to resist them. I appreciate your comment about the house. Luckily I didn't photograph the dust bunnies rolling around. Haha. Hugs back your direction and Happy Mom's Day to you and Aunt Baby. Over the last few years, I have gained such an appreciation for treasures vs possessions. Love your attitude, had to even vote FUNNY, along with UP & across the board! I would never 'look away' from you or your lovely home, filled with so much love, warmth and treasures. I LOVE me a pretty doily! PS-- I have been looking for my Nancy Drew books-- quite the mystery, which has now been solved! Sofs, thank you for stopping here to take a look at these finds. Having enough space is really important to collecting. Many conversations in the store began with "But where will we put it?" Space really is the final frontier. Come back anytime. I keep adding new pictures! You take care. It was nice to see you. My mom collects these same sort of items. You have a lot of very beautiful things in these photographs on this page. Myself, I have been like a rolling stone that has gathered no moss. Or not much anyway. Peg, these pictures here are so beautiful that I am so tempted to collect... I just have no space .. and cannot afford storage for stuff that I cannot use.. LoL you make me jealous. ;) Have a lovely day! Thanks Lynda. Do-se-do around the bargain table with me. See you soon. Hi Lesley, I kind of had you figured for a treasure hunter. You really have to be with your photographic instincts, to get the really great shots like you do. I did the eBay selling in 2009 and haven't done much since then. Guess I purged the boxes enough to feel okay about keeping the rest. The market has really taken a hit on the values that we used to see on collectibles. Thanks for taking time out to drop in and for the really nice comment! Hi Peg, I love treasure hunting too and have quite a collection of porcelain - finding a home for it all is quite a problem so a lot of it is stored away in boxes, I think I will follow your example and try selling it. I loved looking at your wonderful treasures, and thoroughly enjoyed reading, thank you and voted up. Looks like I have some competition in the hunt for treasure, Suzzycue. I've furnished many apartments with 'Early Salvation Army' style. LOL We called our dog Trixie, a Heinz 57 mix! Thank you for taking time to look at this hub and for your nice comments. Hope to see you again, maybe at one of our secret treasure troves. I loved this hub and the photos of your teasure finds. I too am a collector and have spent many happy hours in Thrift Shops. In fact I joyfully describe my apartment décor as heinz- fifty seven. This is a term used by dog owners to say a dog is from many backgrounds and nothing matches just like my décor. I enjoyed the read very much. Lovely hub - it brought a smile to my face as I thought of all of the wonderful items my wife and I have picked up over the years. We love china -particularly art deco. I'm not sure which is best; the anticipation or actually spotting something beautiful sitting amongst some bric a brac! Lynda, How nice to see your face this morning. Long time no see. I've been wondering what you're up to. Things ok? I would really enjoy meeting you and bargain hunting together next time I get to Florida. Usually it is September but who knows with all that's going on out this way. Yes, cheap thrills and I love it! I'll send you an email with the latest. Loved hearing from you. Carnival glass is going quite high these days. It's getting harder and harder to find nice things from the fifties and sixties. Don't you just love it when you unpack a box and discover your own lost treasure? Me too. Sorry to dissapoint but theyt don't seem to be interested in this sort of thing, having said that next week there is a 2day avent in Lamour Plage, so all being well we will get there. i love a good mooch. Oh don't worry about dusting the good China paper plates are fine!! I hate washing up anyway. You are more then welcome we woild have a ball. Take care friend catch up again soon. Hello there Pamela and so nice to see you today! Yes, I had a dream and unfortunately my work load changed dramatically at my real job. I began travelling about 70 percent of the time which left little time for the store. Also there was a major fire in Downtown and it really affected business as several stores were closed for repairs. I'm buying back the Nancy Drew books that I gave away when I moved too many times. They were originally my Dad's but us kids read them growing up. Hi Gloshei! Well, you may be surprised that we eat off paper plates more than the fancy dishes which is a shame, but that's the way it goes. When you visit I'll dust off the good China and we'll have a tea party. That would be so much fun. Are there garage and yard sales there in France? I will be returning the visit for a picture taking trip to your beautiful area.